Jamar Dobson (stripes) scored for Peetrborough Northern Star at Yaxley. Peterborough Northern Star delivered a much-improved performance under caretaker-manager Raff Mazzarella, but still lost their United Counties Premier Division game at in-form Yaxley tonight (November 21). It finished 2-1 to the Cuckoos at In2itive Park to make it four wins in four games under their new boss Andy Furnell. 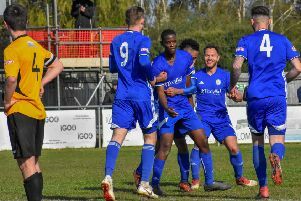 Tom Waumsley and Ross Watson scored for Yaxley with Jamar Dobson replying in the 94th minute for a team who sacked manager Rob Ward at the weekend. Yaxley are 11th in the top-flight table with Star down in 15th, but Holbeach United missed their opportunity to move into third. A win at Boston Town would have accomplished that, but the Tigers went down 1-0 to a 75th minute goal after a performance that angered city-based boss Seb Hayes. There was a cracking Hinchingbrooke Cup tie at Bourne where visitors Ely advanced to the second round after winning a penalty shoot out 5-4 after a thrilling 4-4 draw. Bourne were 2-0 down and then 4-2 up, but Ely were level after 62 minutes of a cracking contest. Adam Rothery, Max Cooper, Jezz Goldson-Williams and Gav Cooke scored the Bourne goals. March competed well in their Cambs Invitation Cup tie against a development team from Cambridge United, but conceded two late goals which sealed a 3-0 defeat. Premier Division One: Boston Town 1, Holbeach United 0; Yaxley 2 (Waumsley, Watson), Peterborough Northern Star 1 (Dobson). First round: Bourne Town 4 (Rothery, Cooper, Goldson-Williams, Cooke), Ely City 4 (Ely won 5-4 on penalties).